Good news for RE fans, The much expected Royal Enfield Himalayan motorcycle will be launched in India on February 2 this year (2016). The launch date of Royal Enfield Himalayan has been strategically placed a day before Delhi Auto Expo 2016, largest automotive show in entire South East Asia. The Himalayan will be globally unveiled by MD & CEO Eicher Motors Limited – Mr Siddhartha Lal. The all new RE Himalayan is going to be a completely new motorcycle. The Himalayan is built on top of a new chassis, and the bike is powered by new 410 cc 1 cylinder air-cooled engine. Himalayan’s engine will deliver 28 PS of power and 32 Nm of torque via 5-speed manual transmission gearbox. 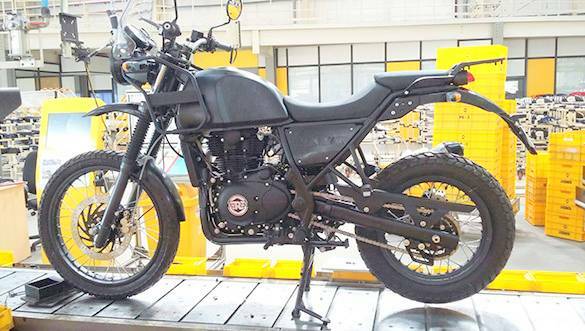 The chassis of Royal Enfield Himalayan has been designed by UK’s Harris Performance Parts, a subsidiary of Royal Enfield that has built Continental GT’s chassis, the latest from Royal Enfield. Himalayan is built to perform as an off-road tourer and is going to be first to feature a rear mono-shock suspension. A very recently accessorised Royal Enfield Himalayan was spied, as revealed in different leaked images of the bike. The spy shots reveal that RE Himalayan gets a very comfortable scooped seat for the rider, while pillion is seated a bit higher. The handle bar and seats are designed in such a way to provide an upright riding position, making long rides easy as well as comfortable. The front forks of the Himalayan gets thin off-road tyre with long suspension travel, where as the bike’s rear gets a very chunky tyre with mono-shock suspension. The circular headlight in the front is fitted with a small windshield and instrument cluster that houses speedometer, tachometer, fuel level, trip meter, odometer, compass and an altimeter as well. The price of Royal Enfield Himalayan is going to be revealed on 2nd February 2016 (on the launch date). Expect the price tag of Himalayan to be under 2 lakh rupees mark. Also check: Royal Enfield 9 new colors with photos. 2016 Chevrolet Niva - New Compact SUV from GM in India?